Polyphyllum meaning "many leaves"is native to the Himalayas from about 6,000 to 12,000 feet. Described by Woodcock & Stearn (1950) as �rare and charming but difficult� they also placed this lily in Afghanistan. They described it as �essentially a plant for the specialist and that it does not take readily to cultivation�. 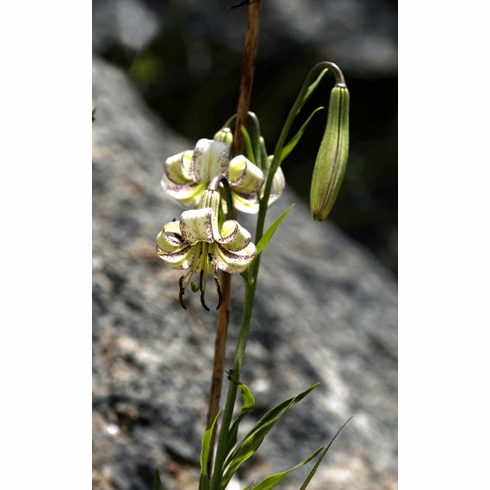 It has the most westerly distribution of any lilies native to the Indian subcontinent. It is quite difficult in cultivation and appreciates a northern exposure. Bulbs prefer a deeper planting than most lilium species as in nature it has been found a depths up to 2 feet, (60 cms) but more commonly at depths of 9 to 12 inches (22 to 30 cms). In the garden, it needs some shade, excellent drainage, and should be kept from the wind. Bulbs do not like being disturbed so seed should be planted where you wish their bulbs to stay. Seed is hypogeal for germination in warm conditions but growth is then delayed through the winter months. 'Lilium polyphyllum' was placed on the IUCN Red List as a critically endangered species and lists the current population as �Decreasing� and "continuing decline of mature individuals". This is a lily on the very edge of extinction as it is considered to have medicinal value and locals harvest them for sale to the medicinal trade as well as destruction of habitat. Title photo was taken in the Gangotri National Forest, India at a reported 11,500 ft. elevation in mid July of 2009. Photo courtesy Wikimedia Commons and was taken by Mana Chandok. This file is licensed under the Creative Commons Attribution-Share Alike 3.0 Unported license. Thank you Mana for this wonderful photo of L. polyphyllum in its natural habitat. Inset photo #1 take at same location, courtesy Wikimedia Commons and was photographed by Vijay Chandhok. This file is licensed under the Creative Commons Attribution-Share Alike 3.0 Unported license. Thank you Vijay for this wonderfdul photo of L. polyphyllum in its natural habitat. Insert photo #2 from the International Union for Conservation of Nature and Natural Resources. Gland, Switzerland web site: https://www.iucnredlist.org/species/50126623/79918170.